New Delhi: The Ministry of Home Affairs (MHA) on Thursday asked the West Bengal government to take action against the officers who had participated in dharna, which was against the CBI attempting to question the city police chief in chit fund scam cases, in Kolkata on February 4 as per All India Services (Conduct) Rules. News agency ANI tweeted that the Centre has taken a dim view of serving officers of uniformed forces taking part in the dharna. In a communication to the West Bengal Chief Secretary issued on February 5, The Ministry of Home Affairs (MHA) had said that as per the information received by it, Kumar sat on a dharna along with some police officers with West Bengal Chief Minister Mamata Banerjee at the Metro Channel in Kolkata, which is prima facie in contravention of the extant provisions of AIS (Conduct) Rules, 1968/AIS (Discipline & Appeal) Rules, 1969. The dharna which started from February 3 evening ended on February 5 after the Supreme Court had directed Kolkata police commissioner Rajeev Kumar to appear before the CBI and “faithfully” cooperate into the investigation of cases arising out of the Saradha chit fund scam, while it making it clear that he will not be arrested. Terming her dharna a victory for the “people, country and democracy”, she had said she was ending it as requested by senior opposition party leaders after the Supreme Court verdict. 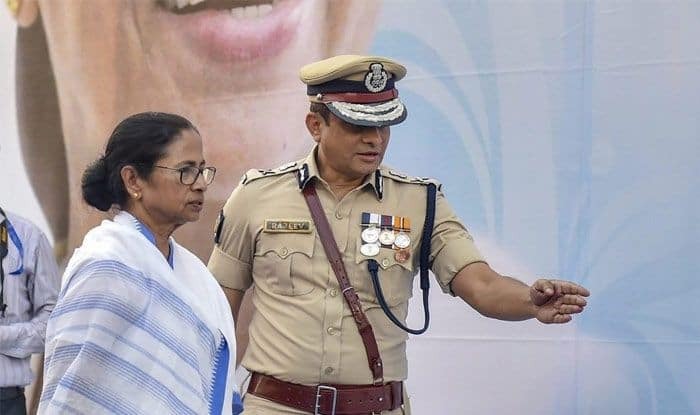 The failed attempt by the CBI to question Kolkata Police Commissioner Rajeev Kumar in connection with the Saradha and Rose Valley chit fund scams became the latest flashpoint between the BJP-led Centre and Banerjee, one of its bitter critics. The CBI has accused Kumar of destroying evidence related to the two fraud cases. A CBI team was prevented from entering the residence of Kumar by Kolkata police personnel and was detained. Later furious Banerjee rushed to Kumar’s residence before beginning a dharna opposite Metro Cinema, one of Kolkata’s landmarks. Congress President Rahul Gandhi and several opposition leaders including Delhi Chief Minister Arvind Kejriwal, Andhra Pradesh Chief Minister N Chandrababu Naidu, National Conference leader Omar Abdullah RJD leader Tejashwi Yadav, DMK leader MK Stalin, and others had extended their support to Banerjee. However, the BJP maintained that it was Congress that had filed a petition in the Supreme Court asking for an investigation into the chit fund scams. “We took oath on May 26, 2014 so all these inquiries in Narada, Saradha scams started before us,” Law Minister Ravi Shankar Prasad had said.